A healthy dog is a happy dog, and, an overweight dog is more likely to develop health problems such as diabetes, heart disease and arthritis, this is something we all intuitively know. But, it seems these days in our endeavors to maintain the health of our dogs, the nutrition debate has become one which is rife with unnecessary complication, and worry. So what should your dog weigh? Does your pet need to be put on a diet? Are you being a responsible pet owner? When we were building this website, it had occurred to me to provide a weight tool, a tool that could give you the approximate BMI (Body Mass Index), for your particular breed of dog. It seemed like a good idea at the time but now I'm kind of glad we didn't. As is always the case when we increase the momentum on any issue with enough gusto, we typically see people ready and willing to clip the ticket on our growing concerns. 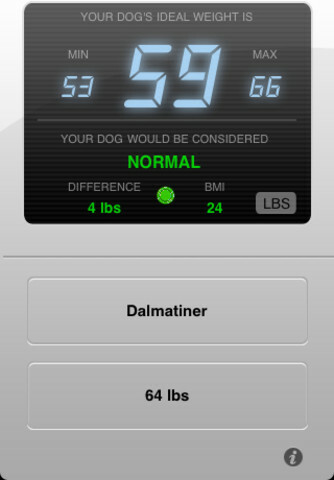 The DogBMI Application is for me one such example. This application calculates the ideal Body Mass Index for your breed of dog, all you do is select weight and breed, and the ideal weight of your dog will be calculated. Well apparently not, and here is why I'm glad we had elected not to run a similar tool on the site. I found after entering the appropriate data, for my miniature schnauzer, 14 inches at the withers, run 4km every second day, with an hour glass figure that he was, according to DogBMI, "obese". Hmmm, that surprised me, I'm reasonably vigilant about his diet, I follow the recommended guidelines, he's exercised daily, and he looks lean? But still according to this App, he could do with loosing 2.5kg? So I took him to the vet. He was checked and weighed, and according to her if he lost the suggested 2.5kg he would be severely underweight? Aside from delivering some questionable information the DogBMI App doesn't really do much. In fact once you have determined your dogs ideal weight, or not so ideal weight as the case may be, all this App does is take up space on your homescreen. I would like to get my money back, although I don't see that happening anytime soon. I think it's best to avoid gimmick apps like this, there are just too many variables for an App this basic. I keep harping on about common sense, but my intuition was telling me my dog was in good health and of a good size and perfect weight for his level of exercise. I was right. Dogs are not unlike humans in the sense that they have different diets, different exercise routines, not to mention different metabolic rates. My other miniature schnauzer from the same litter is two thirds the size of his brother, yet he follows the same routine and eats the same amount, so all dogs in my opinion should be considered on a case by case basis. This following link will take you to a a Body Condition Score Chart. This will give you a handy guideline for determining the right size and shape for your dog.